I Love Airtight Glass Containers! If you’re on the veggie path, sooner or later you’re going to notice that, instead of a freezer full of food, you’re collecting a lot of … ingredients. Things like rice, beans, lentils, and other whole grains. Probably a few types of pasta. Maybe you’re buying some spices in bulk. My partner, in his typical Indian … err, I mean, very frugal fashion … stored a lot of his pantry ingredients in the original bags or in empty plastic butter or yogurt containers. I could tolerate that – at first. But when he moved his cute bearded self and his lentils into my house, I knew there HAD to be a better way. Since then, I’ve become a HUGE fan of airtight glass containers. (Even A., after initially complaining about the cost, is a total convert.) If it’s at all possible to store something in an airtight glass jar, I WILL! 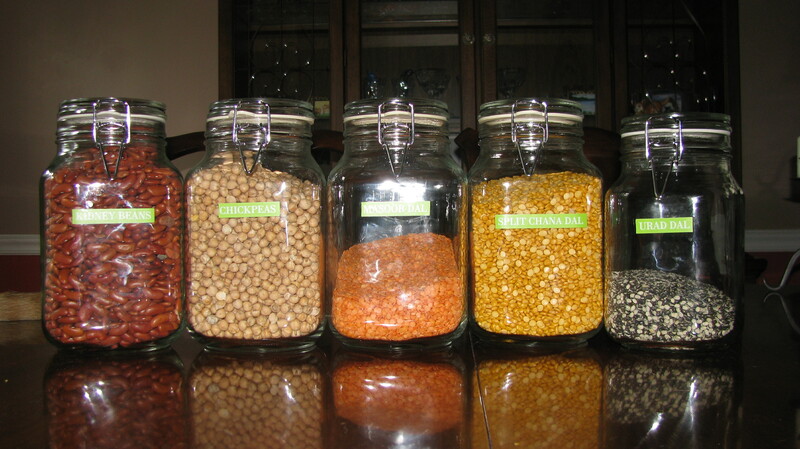 The glass jars keep pests OUT (or, should you buy an infested bag of rice or beans, keep pests IN). I’ve been infested twice. The first time was probably 10 years ago, when some mothlike bugs got into a bag of green split peas. They then invaded the rest of my pantry – crackers, cereal, EVERYTHING. The entire contents of my pantry had to be tossed. The good thing was, I only had about 10 items in my pantry at the time! The second time, I bought a bag of infested rice and unknowingly decanted it into airtight glass containers. I didn’t notice the bugs till later, but thanks to the glass containers, the little buggers didn’t have a chance to spread. 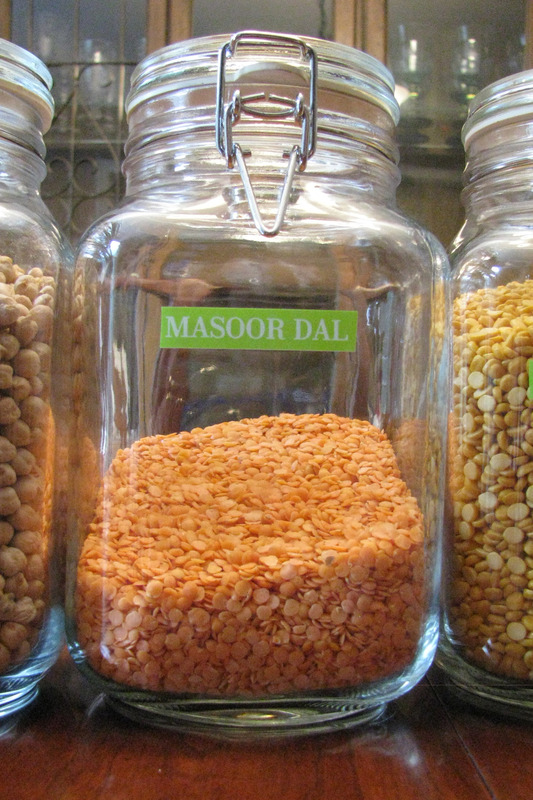 Glass jars keep food fresher. Unlike plastic containers, you don’t have to worry about toxins leaking out, BPAs, or funny smells. I can see at a glance just what’s in my pantry and how much. Glass jars make my pantry more attractive. Where Can You Get Glass Containers? I pay between $2.99 – $4.99 for glass jars, depending on size. You should NEVER pay more than $4.99! I frequently see glass jars and canisters for $10 and up, but trust me you DON’T need to pay that much! Wash jars before using, but make sure they are completely dry before storing food. Store your rice and beans as is, right out of the bag. DO NOT attempt to wash your rice or beans first. You don’t want bugs, but neither do you want mold. Label your jars. Sure, you can see what’s in them, but sometimes it’s hard to tell regular long-grain rice from basmati rice. Or self-rising flour from plain flour. I am a convert as well! I have cupboards full of these things. My barley got those little moths once and I was very happy they were in the glass container. Aren’t those little moths dreadful! I’m glad the rest of your pantry is ok! Thanks, cragdude2011! If you’re weird, then there’s a lot of us weirdos out here. I would hoard glass containers, too, but where I live it seems like peanut butter and most other things are sold in plastic jars these days. Except for pasta sauce – I’ve got a number of glass pasta sauce jars!